Amidst the myriad of decisions about venues, dresses, menus, guest lists and honeymoon destinations it is easy to defer, or even overlook, choices about how your day will be styled. 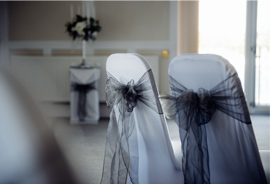 In our experience, deciding how you want your wedding to look and feel is one of the first things you should consider, as it may affect everything from the venue you choose to the colour and style of the bridesmaids dresses. Whether you are looking for timeless elegance, country charm, vintage chic or far-out and funky, Design My Day can create it. With any design, the devil really IS in the detail. It is beneficial to have broad idea of the type of colours or theme you want but it is only through meticulous attention to detail and a keen eye for exceptional finishing touches that a venue will look truly breath taking. Ensuring your flowers co-ordinate with the colours of the bridesmaids dresses and button holes for the gents will of course make the photos look great, but our aspirations run much higher! It is about creating an ‘experience’. In addition to offering our clients a carefully considered and detailed design for the day, we offer a range of bespoke, hand-made ‘finishing touches’, ranging from beautifully crafted place settings and favours to handmade seating plans, all of which are exclusive to Design My Day. To arrange an initial consultation to discuss in more detail what Design My Day can do for you, call Bev on 01872 560010.